Buffalo, NY – The war on terror is not a war that is easily left on the battlefield. The searing memories of carnage and constant vigilance leave an indelible imprint on the young men and women veterans trying to resume normal lives when they come home. Photographer Jennifer Karady used her camera to capture the two inseparable worlds of war and home for 15 veterans. All this month, Cepa Gallery in Buffalo is showcasing her exhibit, "In Country" Soldiers' Stories from Iraq and Afghanistan." For almost two years after coming home from his last deployment Buffalonian and former Marine Jeff Gramlich shut himself off from the world. The strapping 26-year old said he "hunkered down" in his old boyhood bedroom. It still had the green shag rug, the 1980's wallpaper, the sports trophies lining the walls, and his old cork bulletin board covered with Sabres hockey cards. 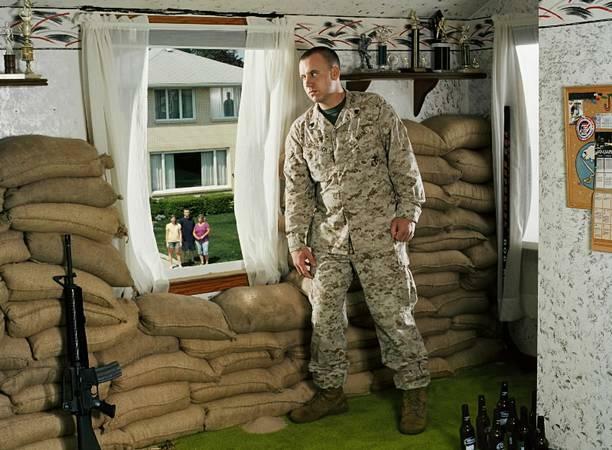 But the exhibit's picture also has some things you will not find in a little boy's room - a military rifle, empty beer bottles, sandbags stacked all around the window - a sniper outside in the distance. And that boy - now a man - in battle fatigues anxiously peering outside from behind the curtain. Gramlich said the photo explained what he was never able to before. The artist Jennifer Karady interviewed Gramlich for weeks to help him decide what moment from his war experiences he wanted to show overlapped onto his civilian life. That moment was a sniper attack. While at his post in Iraq, Gramlich was positioned by a window behind what he thought was a protective fortress of sandbags. A bullet pierced straight through, barely missing him. Gramlich said it left him anxious and hyper vigilant, even years after he came home. To visualize his emotions, Karady worked with Gramlich to stage the sniper attack superimposed metaphorically onto his old boyhood room - just as it felt to him in real life. Gramlich even helped fill the sand bags for the photo shoot. But Gramlich said it was o.k. In fact, he said it was almost like therapy. But he said it was earlier counseling and his family that helped him work through his Post Traumatic Stress Disorder long before he met Karady. He is well now, working on a masters degree at Medialle College and he is the newly appointed assistant coordinator of veteran's affairs there. Karady only works with veterans who have recovered or who never had PTSD. She does not want to re-traumatize them. And that would be easy to do if they were not well-transitioned. She points to another photo in the exhibit staged to show a soldier wielding a knife while shielding himself in front of a wrecked building. But the most shocking part of this photo is not what is pictured in the background. It is the other half of the soldier's suburban yard, with his wife cooking at the grill and his kids playing carefree all around her. Yet another photo depicts a female soldier crawling along the ground, ready to shoot her weapon at the next enemy as her two young daughters, who were not really there, cling to her back. In another photo a New York City veteran, who was homeless for months after coming back from war, is pictured in a city-street scene. He is dressed for battle, crouched and shielding his ears from mortar-like sounds of a garbage truck coming up the street behind him. Karady said this kind of visceral response is common among war veterans. Karady's staged sets and dramatic lighting help give voice to fears veterans often can not fully express. The photos take sometimes three months to finish from concept to final print. She has told the varied stories this way now of soldiers around the country as part of her epic project. Karady said she is not done yet. She said there are more soldiers' stories that need to be told through this unique lens. Wherever she goes, Karady said veterans are eager to participate. Gramlich said it was important to him to be part of the project because he wants to help other veterans understand they too can one day be o.k. You can see and read more about Gramlich and the other veterans in the Soldiers' Stories exhibit at Cepa Gallery until August 27.